The paved walking and biking trail would provide a six-km link to trails being built in Blackfalds and Lacombe and would become part of a route that will one day stretch 70 km from Penhold to Ponoka. Phil Lodermeier, the county's manager of operations, said work in under way to get the necessary agreements from landowners to build the route, which will follow a major project last year to build a bridge over the Blindman River, a day use area and a short stretch of trail from the river to Blackfalds. Negotiations are underway with Canadian Pacific Railway, which must approve a track crossing, and Canada Agriculture Research Centre, which owns a large chunk of land near Lacombe. Lodermeier said CPR must agree to allow walkers to cross a spur line that runs from its main tracks to Rimbey. The railway does not oppose the plan but has yet to put any kind of approval in writing. The county is also working with the research centre to either buy land or arrange an easement. Planners have faced some obstacles finding an acceptable route for the link, which will follow Range Road 27-2. Originally, the trail was to run up the west side of Lacombe Lake, but met resistance from area landowners. It will now run along the east side of the lake, which will provide better access to an under-used day-use area that has fallen into neglect. The estimated cost of the project is $687,000, of which $604,000 will be funded by a special reserve fund the county set up for trails. The rest will come from the operating budget. Grants are available for trail projects and the county's share of costs will come down if the municipality is successful in its applications. It is hoped the stretch from Lacombe to Ponoka can be built in 2012. "The whole trail system is going to be pretty exceptional when it's completed," said Lodermeier. Councillor Dana Kreil also saw lots of potential. "I think this is just fabulous. It's one of those things that puts our county on the map." The society is dedicated to preserving Central Alberta's rail and transportation heritage. The group has proposed a children's theme park and transportation (centre) in Red Deer's Riverlands area. It (is) also looking at creating another attraction somewhere in the county featuring replicas of historic rail stations and a railway park, among other features. The main trail in the natural Springbrook Park has now been paved. The new trail along Airport Drive was paved a couple of weeks ago. The new Springbrook sign at the entrance to the hamlet along Airport Drive is under construction. These are the latest improvements to Springbrook being done by Red Deer County. Earlier this year and late last year, the County finished up the infrastructure upgrades that included the repaving of the roads, replaced the standard lamp posts with decorative ones, replaced the street signs with an aviation theme and put a fence around the municipal reserves to discourage motorized off-road vehicles. The new paved park trail will eventually link up with Penhold and become part of the Trans Canada Trail and there is a plan to add a viewing area near the wetland. The perils of walking and cycling along Hwy 2A between Red Deer and Penhold will be lessened when a trail is built between Springbrook and Penhold in the next year. But there are no immediate plans to build a trail between Springbrook and Red Deer, says Red Deer County community services manager Jo-Ann Symington. She was commenting in the wake of the death of a Penhold teenager who was walking home from a party in Red Deer. He was found dead on the southbound shoulder of Hwy 2A early Thursday morning, just south of the city's outskirts. Police are investigating the death of 17-year-old Logan Jesse Raymond. Symington said building a trail between Red Deer and Springbrook was identified as a possibility within the Red Deer County's Open Spaces Master Plan. "As development occurs from the city and within the county, that's when we would look at connections for trails," Symington said on Tuesday. "We haven't finalized any plans to look at building something within the next few years." The county will develop a trail in Springbrook Park, plus a boardwalk for a wetland viewing area. Work is expected to get underway soon. The next phase will be to build a three-km trail from Springbrook to Penhold, along Range Road 281 as opposed to the old Hwy 2A right-of-way. "Once those (cost) figures are confirmed, we may be doing some construction this fall . . . and maybe finishing the paving next year," said Symington. Several years ago, area residents began pushing for a trail between Penhold and Springbrook because they were concerned with people hiking or cycling on the busy highway. Some Springbrook children use the railway track because it's the shortest route to school in Penhold. Penhold Mayor Julia King sees few pedestrians on the Red Deer to Penhold stretch when she travels the highway. Still, she said last week's death indicates a safety issue and that discussions around a trail may need to be opened. "If both (the city and county) could look at any way they can bring that forward and maybe work with the province on that," King said. King said the town will launch a transportation survey in September. One question will ask whether residents would support bus transit in Penhold that would link up with Springbrook's. The question is whether bus service would have made a difference in last week's tragedy, King added. "It depends on the time that this particular service would be running," she said. Last August, Red Deer Transit began servicing Red Deer County's bustling commercial area of Gasoline Alley, plus the hamlet of Springbrook near Red Deer Regional Airport. The county takes care of operating and capital costs. Symington said the first year of operation has been fairly successful. A review of transit service will be done to see if the county should expand with later hours past the current cutoff at 6:30 pm. A promenade connecting various recreation, sporting and culture facilities will form the spine of a major overhaul planned for southeast side of Red Deer's downtown. The city's recreation, parks and culture department has now spent most of the $200,000 allotted to create a long term plan that knits together the various facilities located between Alexander Way and the Rotary Recreation Park. While still subject to City Council's approval, the plan provides a framework for creating a network of facilities that will meet a wide variety of needs within the community, said recreation superintendent Kay Kenny. City Council is to decide what direction to take with the plan during its regular meeting on Aug. 23, said Kenny. The five phases of the overall plan begin with construction of a promenade between the Golden Circle and the arena facilities at the south end of what is being called the South Area Site, architect Craig Webber of Group 2 Architecture Engineering told the crowd of 80 to 100 people who gathered on Monday evening for a first look at the proposal. One of the key features of the promenade is that, along with linking the site to the city's network of walkways and parking lots, it would provide improved access to popular public market held on Saturday mornings throughout the growing season, said Webber. Most of the vendors and exhibitors would be able to move out of the parking lot where the market is now held and place their booth along the promenade, meaning people attending the market would have access to more of the parking spaces on the site and throughout the city centre, he said. Along with the promenade, plans include creating a large green are immediately south of the Alexander Way, which would require moving the speedskating oval, horseshoe pits and bowling greens to other sites. While a new horseshoe and lawn bowling site would be placed in the southeastern area of the site, the speedskating oval would be removed altogether and rebuilt elsewhere in the city, he said. The proposed plan also allows for expansion of the tennis, skateboarding and aquatic facilities and assumes that the curling club's facilities will eventually be combined with the Red Deer Arena into a large ice facility. Future plans assume that the Red Deer Museum and Art Gallery, already squeezed for space, will eventually find a new home and that the existing building will then be "re-purposed" for the Golden Circle, said (Colleen) Jensen (Director of Community Services). A number of people raised concerns about the impact the plan would have on parking within the site and neighbouring areas, especially when major events take place. Their concerns included worries about participants taking up residential spots in Parkvale. Jensen said those sorts of details are to be worked out over time. "I want to reiterate that this is a concept plan, not a detailed plan, and I understand that there is some discomfort in that. So, this gives an overview in terms of what can happen," said Jensen. People have said they don't want to see a sea of parking, she said. On the other hand, they want to be able to park in front of the facilities they use. "Think what the city is going to look like in 25 years time. We are going to need to put a very sound strategy in place in terms of addressing all of the things you are talking about," she said. Jensen and Webber invited people to full out comment cards for a final report to be included when the plan is presented for Council's approval. Red Deer County will use a City of Red Deer parks development plan for the river valley as a guideline for future expansion of trails and other recreational areas. The city adopted its River Valley and Tributaries Park Concept Plan last month. The plan, which was developed with support from the county, recommends that the municipality consider making the river a municipal park within city limits and put measures in place to protect it. Potential locations for regional trails and parks are also identified in the plan. Councillor George Gehrke said having these kinds of plans in place allows future development proposals to be dealt with much quicker and makes it clear to everyone what the goals of the municipalities are. Twenty-one recommendations are included in the plan, such as creating buffer zones along streams and pursuing federal and provincial dollars to expand the trail system. More than 7,135 acres of park land and 358 km of trails could be added, the plan suggests. In the county, an Open Spaces Master Plan has been adopted to guide development. Council unanimously voted on Tuesday to use both the city and county plans when considering future development. The county and city have long been co-operating on planning for future growth. An intermunicipal development plan signed by the two municipalities calls for the establishment of a linear park system, where possible, focused on the Red Deer and Blindman Rivers and Piper and Waskasoo Creeks. Trekking together along Highway 2A, heading north towards Red Deer from Penhold, a family from British Columbia continued to marvel at their first look at vast prairie farm fields, bright yellow canola crops and a horizon that goes forever. The delights of Alberta are the latest of the many unique Canadian vistas that Heather and Bart Mash of Langley, B.C. have shared with their children since embarking in 2002 on an adventure to hike the Trans Canada Trail all the way from the Pacific Ocean to Atlantic Ocean. For eight years, the Mash family has spent two weeks every summer hiking the cross-country trail system. Starting in Victoria, they have now walked more than 2,230 km across Western Canada over a total of 89 days and want to reach Blackfalds by today. "It's just good family time," Heather said on Friday morning en route to Red Deer. "We started when they were young so that now, even though they're married and don't live at home anymore, we still get together for this two-week time," she said of her daughter Hayley Pongracz, 24, and son Ben Mash, 20. When the crew first started in 2002, they were also joined by Heather's mother, Ann, who walked the entire B.C. route and, at 75, continues to join the family for the walk for at least part of a day every year. Hayley's husband, Darryl Pongracz, 25, and Ben's girlfriend, Tasha Weatherston, 18, have since joined the family on the annual trip. "Walking along, we sort of pair off as couples and chat about stuff," Heather said, adding with a laugh that they even planned Hayley and Darryl's wedding while hiking one year. "We talk about stuff that we never as a family take time to sit down and talk about. So it's just really good family time." In fact, despite all the sights seen and towns visited, it's the time talking with and getting to know her grandmother that Hayley cherishes the most. "You don't realize how much you miss just sitting and talking to them and spending time with your little brother," Hayley said of catching up with her family during the hikes. Ben, on the other hand, has most enjoyed travelling past B.C. to visit new towns and cities. "Every step east that we take is a new place for us because we haven't been this far yet," he said. One of Ben's highlights has been hiking through the Rocky Mountains while Heather's personal Alberta favourite was standing atop Cox Hill, the highest point of the Trans Canada Trail, and looking out at all the skyscrapers of downtown Calgary. The family arrived in Central Alberta on July 17 and decided to set their base in Sylvan Lake. They started hiking near the Calgary International Airport and, after hiking almost 25 km each day, hope to conclude this year's journey in Blackfalds. Heather explained that they also make it a habit to take a day-long break after two days of walking so they can take in some of the local attractions. This year, they visited the Calgary Zoo, West Edmonton Mall and spent Thursday relaxing and playing golf in Sylvan Lake. "There was a point in the middle that we thought Dad should maybe look up the definition of vacation," Hayley admitted. But the family is as excited as ever to continue their journey to the East Coast, which Bart estimates will take them a total of 33 years to complete. The Trans Canada Trail project was initiated in 1992 as a way to celebrate Canada's 125th birthday. Once completed, the system will be comprised of a connection of trails stretching 22,000 km and linking 1,000 communities across the country. More than 15,000 km of the trail have been developed, including a section in Waskasoo Park in Red Deer. For more information about the Trans Canada Trail, visit www.tctrail.ca. City Council adopted a trails and parks planning tool Monday night in the form of the River Valley & Tributaries Park Concept Plan. The long-term plan's purpose is to identify lands best suited for potential trails and parks within the City of Red Deer's 'growth area'. Marking a collaboration between the City of Red Deer and Red Deer County, one of the plan's 21 recommendations urges exploration of one day even designating the Red Deer River a 'municipal park'. Other recommendations include aggressively pursuing provincial and federal funding, identifying parcels for land purchase and the beginning of work with landowners and maximizing the use of Environmental Reserve to acquire lands adjacent to rivers, tributaries, lakes, sloughs, escarpments and other environmentally sensitive lands. "Parks and preservation planning for the City of Red Deer really began in the late to mid-1970s with a plan that talked about the Waskasoo Park System itself," said Trevor Poth, parks superintendent for the City of Red Deer. The purpose of this plan is to talk about where we are to date, but also to look forward to a future vision with a focus on Red Deer having a population of 300,000 people, he said. "It really represents what our vision is for our future parks system." Poth said to keep up the percentage of the City's land area at its current level, as much as 2,394 hectares of new parkland would need to be added to the Waskasoo Park system. Ultimately, he said the goal is to establish a linear park system focused on the Red Deer River, Blindman River, Piper Creek and Waskasoo Creek. "The key to this plan is to tie all of those areas together into one uniform parks system," he said, adding the area has a unique ecosystem that he pointed out has been well protected over the past 30 years. "This is just an extension of that, and a huge future benefit for the community." Key principles that also guided stakeholders' formation of the plan include following the river, connecting with trails, respecting nature and 'mixing it up' -- working towards a balanced park system with "lively populated places and quiet, solitary respites." Councillors were impressed by what they heard. "It helps to bring great tourism opportunities to the area," said Cindy Jefferies. "More and more, people are looking for more active holidays. The partnership with Red Deer County has also been great, and this is a real positive thing for us to work on together. So let's get on with it," she said. Councillor Larry Pimm said currently, the Waskasoo trail system means a great deal to local residents. Expansion of it only bodes well for future generations, he said. "To me, Waskasoo Park has been a great amenity for my family and I hope my grandchildren will be able to take their grandchildren through the additional areas and show them the wonderful things of nature." Meanwhile, City Council also approved the Environmental Master Plan's Situation Assessment -- the first phase of the plan that will guide Red Deer's environmental future over the next 25 years. Core directions identified to achieve the vision including 'Encourage, Educate, Engage, Enable, Expect', prioritizing growth to create vital, compact communities and protecting and enhancing green spaces. "It was so important that Red Deerians offered their opinions and ideas on how Red Deer can continue to not only improve its rich natural environment but also minimize our ecological footprint," said Lauren Maris, environmental program specialist with the City of Red Deer. For more about the Environmental Master Plan, check out www.reddeer.ca/environmentalmasterplan. Two issues have come in conflict in Sylvan Lake with residents wanting both a new skateboard park and the preservation of an abandoned rail line that has become a cherished park but not the two projects together. The town had wanted to build the skateboard park in the green space close to H.J. Cody High School. However, several people objected in order to preserve the former Canadian Pacific Railway right of way, that was originally part of the Alberta Central Railway, as an east-west linear park left in its 'natural' state although a recreational trail is anticipated. Town council decided to look for an alternate site for the skateboard park. The grand opening of the Blindman River Bridge held last Saturday marked the successful completion of a long-term project which will serve as a key link of the TransCanada Trail, that links communities from coast to coast. The event, held at the new bridge, located about 1.8 km south of Hwy. 597 on Range Road 27-3, attracted dignitaries from federal, provincial and municipal levels of government as well as the public and representatives from other groups and organizations. Master of ceremonies for the event and president of the Central Alberta Regional Trails Society, Debbie Olsen said CARTS' dream to connect the communities of central Alberta using trails expanded to include the vision of not only connecting these communities to each other, but connecting them to the rest of Canada via the TransCanada Trail. "But one of the biggest challenges of building this trail was getting across the Blindman River. As a key part of the central Alberta trails system, this bridge took years of planning and coordination from all of the municipalities in central Alberta. We also received funding and support from several levels of government and provincial and national organizations. To be honest, some of us wondered if it would ever be built, but here we are." Lacombe County Coun. Linda Landmark who also spoke at the opening, said the bridge marked a new chapter in the county's history book and would be noticed by future generations. "Someday, someone's going to say, 'wow, who had the vision to put this all together.'" The original plan for the approximately $300,000 bridge, began in 2006. Construction was completed in April. The dream to have a recreational trail for hikers, bikers and roller bladers from Red Deer to the far end of Lacombe County is one step closer thanks to a pedestrian bridge over the Blindman River. The grand opening of the project on Saturday afternoon was a chance to celebrate International Trails Day and drew around 70 people to the site. The crowd was made up of members of the Central Alberta Regional Trails Society, federal, provincial and municipal politicians, those who built the project and others. The more than $300,000 bridge project, which was completed in April, is accessible from Red Deer by going to the end of Taylor Drive and then driving north close to five km along the C&E Trail until you get to the Blindman River. Debbie Olsen, president of the Central Alberta Regional Trails Society, said it seemed like a mammoth project when the society and the Central Albertan municipalities started working on it many years ago. They had the dream of connecting Central Alberta using trails that would allow people to walk or ride their bikes from Red Deer to Blackfalds and then to Lacombe. She said the bridge will be a key link in that project and also in the Trans Canada Trail, which is a national network attempting to link trails across the country. Phil Lodermeier, manager of operations for Lacombe County, said the bridge is the start of a two-km paved trail, following north along the C&E Trail into Lacombe County that the municipality will be working on this summer. "It's really the start of our trail system in Lacombe County. We were a real rural county. We concentrated on core services. "We built roads and paved roads and we maintained them so getting into recreation was something different for us" Lodermeier said. "We think it's a huge amenity for our residents to have a healthier lifestyle and the ability to do something different. When we develop areas like this they can picnic and enjoy nature and get a good workout too." He said in 2011 Lacombe County has plans to continue the trail from Blackfalds to Lacombe, likely along the east side of Lacombe Lake. Eventually the county hopes to have 20 km of trails from one end of the county to the other. Lacombe County and the federal government each donated $50,000 towards the project. The Alberta Trail Net put $100,000 towards it. Trans Canada Trail gave $67,000 and the National Trails Coalition put $50,000 towards it. Armstrong Consulting Services did the project planning, with Sveinson Consulting Engineers Ltd. doing the bridge design and Timcon Construction Ltd. doing the bridge fabrication and installation. The 41 Combat Engineer Regiment, made up of the 33rd Engineer Squadron from Edmonton, installed the bridge deck and handrails as part of a training exercise in March for free, but the value of the work they did was estimated at $50,000. Capt. Anthony Wachtler said it only took the Canadian reserve unit a weekend to put the deck and handrails on the bridge, with 30 people from the regiment on site. On the Saturday morning they started the project it snowed, but they had no shortage of warm clothes and pressed on with the project. "It is a reserve unit so we like to practice our construction skills and to do that we try to do one project a year," Wachtler said. The bridge project offered the reserves a chance to practice their skills, while benefitting the community. 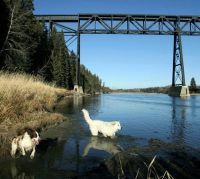 A two-km trail from Blackfalds to the new pedestrian bridge over the Blindman River will be built this summer despite a failure to convince a couple of property owners to sell strips of their land for the project. Lacombe County operations manager Phil Lodermeier said on Thursday that winter-long negotiations failed to produce a deal with two landowners, who were concerned about allowing a walking trail next to their properties. They were mostly worried about garbage, trespassing dogs and the prospect of people scouting out their property. As an alternative, the county will create a walking trail next to an existing gravel road that will lead from the bridge to Blackfalds. The county plans to pave 1.2 km of the road from the bridge and mark out a two-metre-wide pathway. "This is our best that we can come up with at this point in time," said Lodermeier. A right-of-way was secured a short distance from the remaining 800-metre portion of road so it will be left gravel. Lodermeier said the area the paved road passes through is zoned commercial/industrial. When that area is developed, the builders will be expected to create a trail as part of their development approval. The county has earmarked $225,000 for construction of the trail. A $60,000 day-use area is also planned at the bridgehead on the north side of the river. It will include parking for six to eight vehicles, a washroom and several picnic tables. The county has applied for a $58,000 grant to cover most of the cost. Council unanimously approved tendering and awarding the trail contract. A motion was also approved to take $60,000 out of reserves to cover the cost of the day-use area construction in case the grant doesn't come through. It is hoped the two-km section of trail will become part of a 71-km route from Penhold to Ponoka. The project an effort being led by the Central Alberta Regional Trail Society. Sections of the trial are close to or nearing completion, including a stretch running through Red Deer County between Springbrook and Penhold, stretches within Red Deer, and a portion south of Ponoka. A pedestrian bridge was built over the Battle River in Ponoka this year similar to the Blindman River bridge. 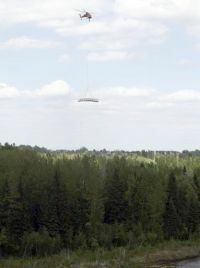 A heavy-lift helicopter was brought in from British Columbia Wednesday to install two walking bridges in Red Deer's Maskepetoon Park. It was the latest step to develop the ecologically sensitive park, which is located on the north side of the Red Deer River across from Heritage Ranch along the western boundary of Red Deer. The Maskepetoon Park Master Plan was approved by city council in 2008 to guide the low impact development of the 30 hectares to provide residents with a natural retreat while also protecting the unique parcel of land. "By developing it, it does two things," said Dave Matthews, planning and technical services supervisor with the City of Red Deer. "The main thing is it's going to give people in the city the opportunity to go in and enjoy that natural area." Secondly, he said the improvements will deter residents from using off road vehicles such as ATVs or dirt bikes that cause damage to Maskepetoon's tamarack fen area, mixed white spruce area, wetlands and animal habitats. "When you develop an area like that, it tends to get rid of the illegitimate use that's causing the damage," he said. "It's kind of funny, but by developing an area you actually save an area because now there's boundaries there." The chopper picked up the bridges, both weighing in at 7,257 kgs (16,000 lbs.) from the staging area at Great Chief Park late Wednesday afternoon. They were taken one at a time along the Red Deer River and installed above waterways in Maskepetoon Park, which nestles the community of Oriole Park West. The city opted to use a helicopter to drop the pre-constructed bridges so to avoid environmental damage trucks and traditional bridge construction would have caused, Matthews explained. "In the end, really from a cost perspective, it's negligible," he said of the difference between on-site construction and using the helicopter. Had the bridge been built in the park, Matthews said, the city would have faced the additional expense of reclaiming any land damaged during the process. The total estimated cost to fly both walking bridges to the park will be about $95,000, the majority of which covers the trip the helicopter had to make from B.C. Matthews said there was no such helicopter in Alberta available to do the lift at this time. The price is worth it, he argued, for residents who want to escape from the urban bustle without leaving home very far behind. "It's always nice when you live in the city to be able to not go very far and feel like you're out in the middle of nowhere," Matthews said. "Consistently, when residents are asked what they like best in Red Deer, parks and trails are always one of the highest items that are mentioned. As our population grows, we also want to grow our park areas for people to enjoy." Jacquie Leedahl, an Oriole Park West resident, brought her two children to Maskepetoon Park to watch the second bridge lowered. She often walks her dog along the river in the park and was glad to see the city was giving nature the respect it deserves. "I like that they're going to keep it natural," she said. The bridges, which were built out of metal and wood, were constructed specifically for Maskepetoon Park. Park development started in 2009 and so far a staircase descending from the escarpment down into the park along the river, a boardwalk built along the wetlands and some trails have been completed. The additional trail work is expected to be done by the end of this year while it is anticipated that interpretive signage will be installed in 2011. Development of Maskepetoon Park should be complete by 2012, Matthews said. A crew of soldiers who helped build a bridge for hikers and bikers will join in celebrating its grand opening on International Trails Day, Saturday, June 5. Members of 41 Combat Engineer Regiment helped install the bridge crossing the Blindman River between Red Deer and Blackfalds. The bridge was placed this spring on the C&E Trail, between Hwys 2 and 2A, where a highway crossing was removed a number of years ago. It will become a part of the Central Alberta Regional Trail, running 70.6 kilometres from Penhold to Ponoka, through Springbrook, Red Deer, Blackfalds and Lacombe. Access to the site is from the north side of the river, off of Hwy 597 and then south on either of Range Road 27-3 or the C&E Trail. Celebrations begin at 1 p.m. with a ribbon-cutting and remarks, followed by a picnic lunch. Please call 403-782-3017 to learn more. A pair of bridges are now finished and progress is being made on a regional trail running between Penhold and Ponoka, says the president of the Central Alberta Regional Trail Society. CARTS members, including the various trail groups and municipalities taking part in the 70.6-kilometre proposed trail, will review progress made to date and look for ways of getting more trail built over the next number of years during its annual general meeting on Wednesday, president Debbie Olsen said on Monday. Olsen said members hope the meeting will attract people who would like to learn more about trail development in the region. While not directly involved in building trails, CARTS was formed to provide support and guidance to local trail development groups, said Olsen. Sections of the proposed regional trail are at or near completion, including a portion running through Red Deer County between Springbrook and Penhold, some sections inside the city and the section working south from Ponoka toward Lacombe County, she said. Trails within the Town of Lacombe, built largely by marathon runner Bill Neilson, have been included in the route. While much of the trail remains incomplete, bridges were built earlier this year over the Blindman River, south of Blackfalds and inside the Town of Ponoka, crossing the Battle River, she said. Funding for the bridges was shared between all three levels of government and with federal and provincial agencies involved in the Trans Canada Trail, including the National Trails Coalition and Alberta Trail Net. CARTS will host a grand opening of the Blindman River bridge on June 5, which is International Trails Day. Included on the guest list are members of the Canadian Army Corps of Engineers who played a key role in its construction. Details of the celebration are to be announced shortly. A grand opening date has not been set for the bridge in Ponoka. The Ponoka section of the trail is now moving southward toward the Lacombe County boundary, with members hoping to connect at the J.J. Collett Natural Area, said Olsen. Other key sections still to come are trails connecting the city and towns along the route, which will provide a safer ride for people who currently use Hwy 2A to ride between Red Deer and Lacombe, she said. One of the biggest challenges still facing the group is convincing rural landowners to support construction of trails along abandoned railway lines running past or through their properties, said Olsen. A number of rural landowners in Alberta still resist the idea, concerned that garbage will be strewn along the trail and that there will be an increase in vandalism. Records to date have shown that vandalism and littering are actually less of a problem in areas where trails have been built, said Olsen. Red Deer County's Open Spaces Master Plan has received the Recreation Industry Excellence Award for Parks and Open Spaces from the Recreation for Life Foundation. The County, along with consultants Dillon Consulting and EVS Labs, worked on the plan for four years after the 2003 Community Services Needs Assessment determined that residents wanted for parks, trails and open spaces. The first project under the plan is the Springbrook to Penhold trail which got under way last year and is expected to be completed this year. Future elements of the plan include trail linkages from Springbrook to the Red Deer River, the city of Red Deer and Gasoline Alley. Another future element is a trail between Red Deer and Sylvan Lake using portions of the former Alberta Central Railway right of way that will connect with trails to Springbrook. Army Reservists have completed their portion of the construction of Blindman River pedestrian bridge ahead of schedule and will not be on site this weekend, an Armed Forces spokesman said Thursday. Great weather, great planning and a lot of hard work allowed the Army Reservists from 41 Combat Engineer Regiment to complete the installation of the decking and hand rails in one weekend, March 13 and 14. Originally scheduled to be installed over two consecutive weekends, the wood hand rails and decking were the final phase of Blindman River pedestrian bridge project. The bridge is located north of Red Deer on the C&E Trail. It is part of a regional trail system linking communities throughout Central Alberta. Lacombe County and the federal government each donated $50,000 towards the bridge project. Alberta Trail Net contributed $100,000, Trans Canada Trail $67,000 and the National Trails Coalition $50,000. The reservists donated about $50,000 worth of their time and expertise. 41 Combat Engineer Regiment was created to provide engineer support to 41 Canadian Brigade Group. The home station of the regiment is in Edmonton and it consists of a Regimental Headquarters, 25 Engineer Squadron in Edmonton and 33 Engineer Squadron in Calgary. Red Deer's parkland is anticipated to grow by more than 7,135 acres by the time the city's population increases to 300,000 in the next several decades. The City of Red Deer is working with Red Deer County on extending the city's popular park and trail system collectively known as Waskasoo Park. On Wednesday, a public open house on the River Valley and Tributaries Park Concept Plan was held at Balmoral Bible Chapel on 55th Street. The plan was developed to identify lands best suited for potential trails and parks within the city's growth area, some of which is currently within county boundaries. It's estimated the city, at more than 89,000 people, could reach 300,000 in about 45 to 75 years. Besides parkland, the plan proposes 358 km of trails. It also suggests having 13 park nodes, which are larger gathering areas such as Red Deer's Bower Ponds. Some of those nodes would occur along the Red Deer River, while others would feature natural areas and passive recreational opportunities. The estimated 2010 cost to fully develop the parkland and trails is $191 million, or about $52,000 per hectare (2.47 acres). Red Deer County Mayor Earl Kinsella said this is a plan that will allow prized parkland to be protected as development occurs. "One of the things you can't do is develop a green space if you already put a housing complex over (top)," Kinsella said. County Community Services manager Jo-Ann Symington said the planning tool looks at a time frame of up to 50 years for development. "We're not saying we're going to go build a trail or park through someone's land tomorrow," she said. "But as development and annexation occurs, those are things we will take into consideration." Dave Kyme attended the session so he could get a close-up look at the concept plan. His farm is 10 km northeast of the city and directly next to the river. Since he knew parkland development would occur eventually, Kyme said he's prepared for it to happen. People can give input on the concept plan during Saturday's Let's Talk 2010 session with council and department staff. The event runs 9:30 a.m. to 6 p.m. at Parkland Mall. Red Deer Parks Superintendent Trevor Poth said the plan wil likely go forward to city council for consideration in early April. A Tar-ific Construction worker passes timbers to a colleague working inside the foundation of the new Blindman River walking bridge south of Blackfalds Monday. It and another over the Battle River in Ponoka are part of the Central Alberta Regional Trail's long-term plan to build a 70.6-kilometre, multi-use trail between Ponoka and Penhold as part of the Trans Canada Trail Network. Enough Lacombe County landowners have warmed to the idea of a trail on their land so that a route from the Blindman River to Blackfalds could be ready this summer. "It's been a bit of a challenge for us in negotiating," said Phil Lodermeier, the county's operations manager, on Thursday. However, two or three property owners on a route near the C&E Trail have come on board and a route is now almost secured. "If we get one more, it looks like we'll be able to do it." The county put $225,000 in its budget to build the trail and $50,000 for the bridge. Alberta Trail Net contributed $100,000 towards the bridge and the National Trails Coalition $50,000. 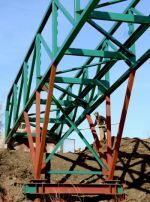 The project took a leap forward earlier this week when crews erected the framework for a pedestrian bridge across the Blindman River about two km south of the town. Dozens of Canadian Armed Forces engineers are going into action March 12 and 19 to lay the planking for the bridge and bolt on handrails. 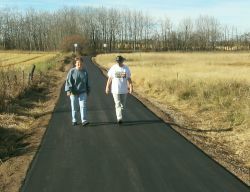 If all goes to plan the trail to Blackfalds should be ready for hikers and cyclists by July or August, said Lodermeier. A similar bridge over the Battle River near Ponoka was put in place earlier this month and will be finished off in the spring. The two bridges are part of a long-term plan to build a 71-km multi-use trail between Ponoka and Penhold as part of the Trans Canada Trail Network. The Ponoka project also received $100,000 from Alberta Trail Net and $85,000 from the coalition. Lodermeier said the 12-km stretch of trail between Lacombe and Blackfalds could be complete in the next two to five years. That trail would also link up to trails within both communities. Work to install the new 140-foot long walking bridge over the Battle River is nearing completion. The bridge north of the 57th Avenue train crossing was built by Will's Welding, and after it was placed on pilings by crane, a crew from Will's has been welding the joints and installing the wooden planking. Here, Kyle Penrod welds a joint in the railing. Deadline to finish the bridge and provide an accounting of federal grant funding is March 31. The trails through Ponoka's river valley are part of the TransCanada Trail system. There is also a new footbridge over the Blindman River that will help create a trail linking Penhold to Ponoka. Work is to be finished by the end of March on pedestrian bridges connecting the Central Alberta Regional Trail. With support from the Town of Ponoka and Lacombe County, members of the Central Alberta Regional Trail Society are guiding construction of bridges crossing the Blindman River, south of Blackfalds and the Battle River inside Ponoka town limits. Construction of both projects has to be finished by the end of March to qualify for federal economic stimulus grants announced last fall, said Ponoka town councillor John Jacobs, one of the key figures in the trail project. Footings for the Ponoka bridge were placed last fall and a local welding shop has been building the five sections. They are to be welded together at the site, likely on Feb. 3, said Jacobs. A crane has been arranged to put the sections in place, but whether it goes ahead will depend on the weather, he said. 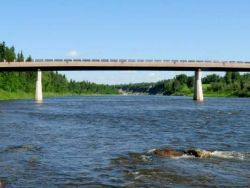 CARTS president Debbie Olsen, who has been more closely involved with the Blindman River project, said the group has set a tentative date to bring military engineers from reserve units in Calgary and Edmonton to build the bridge deck. The group hopes to be able to arrange a safe viewing area for people to watch progress on the deck, which will be part of a military exercise, said Olsen. Ponoka could not get military engineers because its construction work will be underway at the same time as Blindman, said Jacobs. Military engineers are fully occupied in Haiti and Afganistan, so they were unable to offer enough people for both projects, he said. The Blindman bridge will be the second trail bridge military engineers have built in Alberta, he said. The two bridges are part of a long-term plan to build a 70.6-kilometre, multi-use trail between Ponoka and Penhold as part of the Trans Canada Trail Network. Bridges are going up right away, even though large segments of the Central Alberta trail have not been put in place, said Jacobs. The trail will have to cross some rivers, so organizers felt it imperative to get the bridges in place first, he said. At this point, the section from the south side of Ponoka to the Lacombe County boundary is now ready for use, with further construction to take place over time. Support for the Ponoka bridge has included donations of public and privately-owned land to give access to the bridge, said Jacobs. The Ponoka project has received $185,000 in federal money through the National Trails Coalition, $85,000 from Trans Canada Trail and $100,000 from Alberta Trail Net. The Blindman project has received $50,000 through the National Trails Coalition, $100,000 from Alberta Trail Net and $50,000 from Lacombe County. CARTS is seeking additional funding to start building a trail from the new bridge to the town of Blackfalds.